A weather radio is something everybody should have in their emergency preparedness kits. There are many weather radios available, which can make choosing just the right one seemingly difficult. I live in Florida — a state also known as Hurricane Alley. So, I want the best weather radio I can find. I also didn’t want to spend an arm and a leg buying a decent weather radio. I shopped around and did plenty of research, because I’m one of those techies who needs to know everything about an electronic product before buying it. It’s inexpensive but is also reliable and offers a substantial number of features. It’s simple to use yet has more to offer than the most basic models. It provides the weather information, weather forecasts, and severe weather updates I need. The Midland WR-120 weather radio can be bought many places where electronics are sold — including pharmacies, department stores, and, of course, Amazon. I mentioned earlier that affordability was a factor in deciding which weather radio I bought. While I purchased an inexpensive weather radio (less than $50), I certainly didn’t buy one of the cheapest weather radios. I’m not against saving money, and I can be rather frugal. But I advise you not to buy a cheap weather radio — it may not be very well made and could possibly let you down just when you need a weather radio the most. Midland Radio is known as a so-called value brand, but it’s also a well-established name with products that last a long time. By the way, don’t mistake my enthusiasm for Midland Radio or its products for financial or familial partiality to the company. I have no financial stake in Midland Radio whatsoever, nor do I have any personal connections to the company. I’m simply a satisfied customer! Midland Radio was founded in 1960 and is widely known for making reliable 2-way radio systems, CB radios, and weather hazard alert radios. 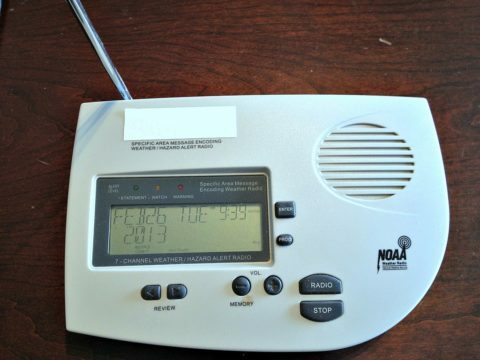 My Midland weather radio provides advisories for local storms and daily forecasts. Thankfully, I’ve not had to use my weather hazard system for hurricanes, blizzards, or tornadoes. 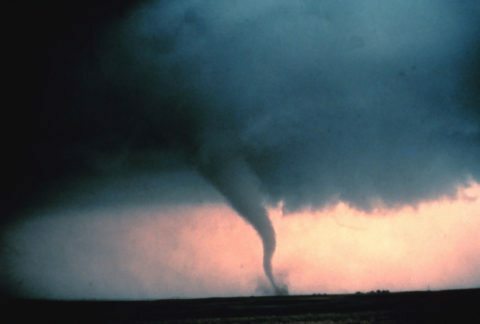 But it’s designed to pump out audio-visual alerts when the local branch of the National Weather Service, a division of the National Oceanic and Atmospheric Administration (NOAA), issues them for major weather events. The Midland WR-120 also allows you to select what types of advisories you want the radio to warn you about. For example, if you want alerts for only hurricanes and tornadoes, you can select that as an option. Or, if you want to receive warnings for all advisories, you can choose that, too. The WR-120 also has a voice warning system — which is ideal for those who are visually impaired or individuals who want clear, verbal info during severe weather events. Additionally, the Midland weather radio has a basic clock feature with an alarm option. Weather radios may seem unnecessary in the era of TV weather reports, The Weather Channel, and, of course, umpteen-thousand weather apps for your phone. The thing to think about is that you may not always have access to a TV. And the Weather Channel is a great nationwide network, but it’s not necessarily fixated on providing you with local weather alerts. As for those weather apps? Cool, yes — but apps are not always reliable and may not offer official weather alerts from your local NOAA branch. Enter the weather radio — a trusty device with (usually) an old-fashioned telescopic-style antenna. It can function on batteries and deliver up-to-the-minute, local NOAA weather advisories during blackouts and cell phone service disruptions. Really, you must have a weather radio because it can serve as a lifeline for providing important weather alerts and info that you may not be able to get anywhere else. 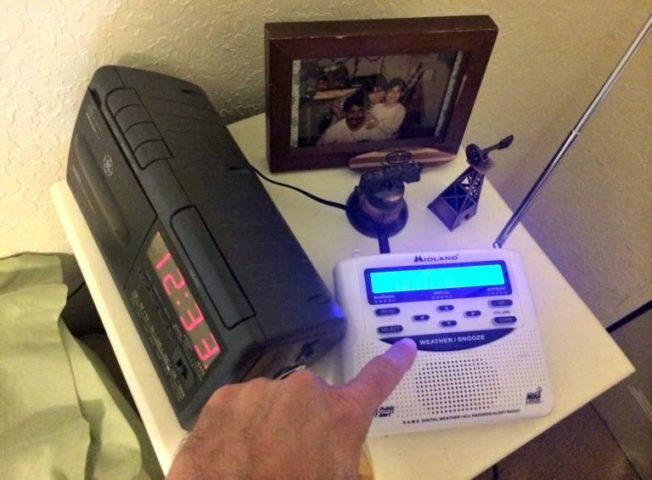 For a relatively small investment (I paid about $35 for my Midland weather radio), you can buy an alert system that will help you stay in the know during dangerous weather events or other natural hazards. Whether you buy the Midland WR-120 or another weather radio, you won’t regret spending money on one. I know I certainly haven’t! You certainly have no shortage of options when it comes to buying a weather radio. It’s not like the old days, back when there were a only few different types of weather radios available. Today, there are dozens of different kinds of weather radios on the market — ranging from extremely basic, cheap weather radios to deluxe models with all the bells and whistles. Buy a model that’s easy for you to use — Whether you’re tech savvy or think you don’t get along with electronics very well, make sure you test-run your weather radio and are confident in using it. Make sure you buy a weather radio from a reliable brand — I’m one of those folks who swears by particular brands. Why? Because there are certain companies whose products I’ve grown to trust. Don’t cut corners when buying weather radios. Pay the extra few dollars to buy a weather radio from a manufacturer that offers durable products and substantial warranties. Get one that offers audio-visual alerts — I suggest you buy a weather radio that has a light warning system along with audio alerts, such as beeps, alarms, and/or vocal warnings. It’s ideal to have multiple alert systems in case a weather warning is issued while you’re sleeping, busy with work, or otherwise distracted. Make sure you buy a weather radio that picks up your nearest NOAA weather station — Most weather radios will receive alerts within a 25- to 40-mile radius of your nearest NOAA reporting station. Very few areas don’t have a NOAA station within that distance. So, make sure that your weather radio can receive info, forecasts, and alerts from your nearest NOAA station.